Artlink hosted its Juried Exhibition in a temporary gallery space at Park Central Feb. 7, and while the event has been held for 19 years, the focus wasn’t on the past but on a promising future. 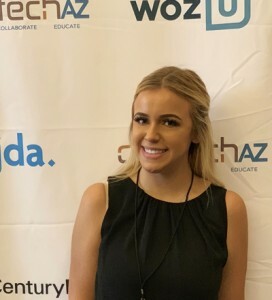 For Cauley, the award validated everything she has worked on since she quit her day job at the Boys & Girls Club three years ago. 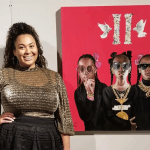 Cauley works with young girls and re envisions them as rappers. 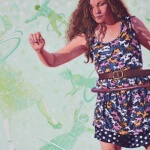 One of her main focuses is girl empowerment. She said you don’t often see portraits of little girls of color hanging in museums and galleries. Her entire collection is girls of color ages 5-10. Two of the three girls in the portrait were in attendance at the exhibition Thursday. 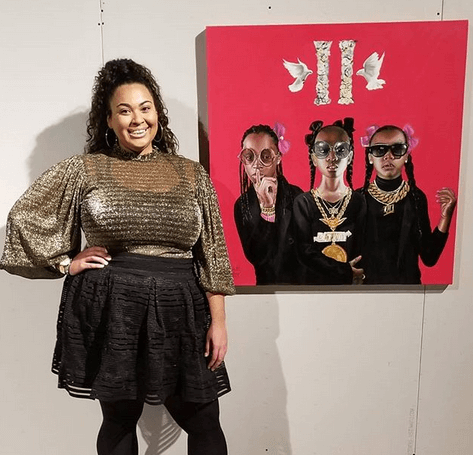 “The fine art world is non existent in the black community and it’s one of my goals to be that representation, and to integrate that into the community to help to build up that next generation of artists,” said Cauley. 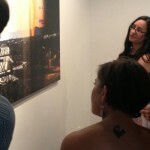 Cauley said that winning, in a gallery space as big and different, was an amazing feeling. The space was provided by Park Central to Artlink, with temporary walls and lighting brought in just days before the exhibition opened. Works in progress. Juried Exhibition installation. Photo by Peter Deise courtesy of Artlink. 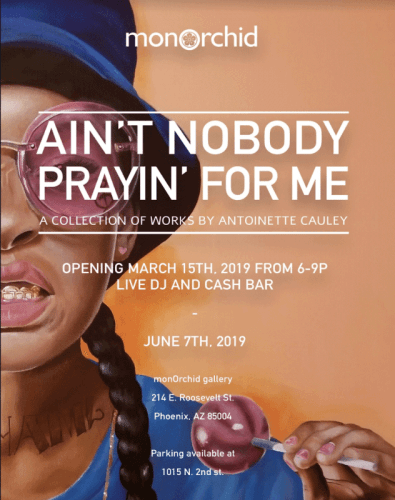 See Antoinette Cauley’s collection of works in her first solo show “Ain’t Nobody Prayin’ For Me” opening at monOrchid on Friday, March 15, during Artlink’s Annual Art Detour. 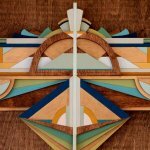 Opening Reception: March 15, 6 to 9 p.m. 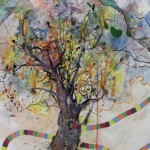 Location: monOrchid, 214 E. Roosevelt St.
Ed note: DPJ publisher Catrina Kahler is President of Artlink Inc.